Information on history, celebrations and chief guest list of Indian Republic Day. India will celebrate its 70th Republic Day on 26th January in 2019. People across India celebrate much awaited Republic Day on January 26 each year. It’s an historical event as India’s constitution was implemented on January 26, 1950. Republic Day is celebrated with great patriotism and enthusiasm all over India as on this day the nation become an independent republic. This year India will celebrate its 69th Republic Day and as usual New Delhi (capital of India) will host a range of events displaying military parades and cultural backdrop. Republic Day of India - Republic Day of India is celebrated on 26th January every year to mark the historic day when our country came into its own as a sovereign republic nation. After gaining independence on August 15, 1947, India did not gain complete independence until the adoption of its own constitution. Thus, the Indian Republic Day marks the successful attainment of the goal of ‘Sampoorna Swaraj’. The Indian Constitution officially came into force on 26 January, 1950. As a republic, the constitution provides for an elected government and lays stress on political equality. Republic Day is celebrated on 26 January every year to mark the glorious event of India becoming a sovereign republic. Dr. Rajendra Prasad taking oath as the first President of free India is chronicled in the history of independent India. South African President Cyril Ramaphosa will be the main chief guest at 2019 Republic Day celebrations to be held in New Delhi, capital of India. Earlier in Nov 2018, US President Donald Trump refuse the invitation due to scheduling constraints. This has been seen as a major setback by political parties in India. The concept of complete Independence took root at the Lahore session of the Indian National Congress on 31st December 1929, presided by Pt. Jawarhar Lal Nehru. In this landmark meeting, all the leaders came together to pledge for complete independence from the British rule. After the Civil Disobedience movement, January 26, 1930 was observed as the ‘Purna Swaraj’ Day and was observed by Indian political parties and freedom fighters. Later, on December 9, 1946, the Indian Constituent Assembly appointed a number of committees to work towards the proposed constitution. After several debate and revisions, the Indian Constitution was officially adopted three years later on November 26, 1949. The momentous event is observed on January 26 with patriotism and dignified celebrations. Every year the celebrations are customarily planned on a massive scale in New Delhi. The most significant part is the grand parade at Rajghat and the display of pageantry in the form of floats. The President of India unfurls the National flag to the synchronized recital of our National Anthem and through a grand 21-gun salute. Next he proceeds to confer the highest gallantry awards like the Ashok Chakra, Kirti Chakra, Shaurya Chakra and Sena medal to personnel from the Armed Forces in recognition of their courageous acts. The President also awards medals of bravery to civilians for acts of valour in adverse situations. The winners of National Bravery Awards wave to the spectators from military vehicles. The Prime Minister of India pays homage at the India Gate memorial, and observes a two-minute silence in the memory of soldiers who lay down their lives for their country's freedom, and observes a two-minute silence in the memory of soldiers who lay down their lives for their country's freedom. The parade sees the august presence of the President of India, Prime Minister of India and some high-ranking officials. As a custom, dignitaries of other countries are officially invited as the guest of honor for the Republic Day celebrations. Japanese Prime Minister Shinzo Abe graced the occasion in 2014. Barack Obama, President of United States of America was the chief guest for 2015 Republic Day celebrations in Delhi. In 2016, French President Francois Hollande was the chief guest at Republic Day parade in New Delhi. In last year, Abu Dhabi Prince HH Sheikh Mohamed bin Zayed Al Nahyan was Chief Guest at Republic Day. The parade starts from Raisina Hills near Rashtrapati Bhawan and goes past India Gate to the historic Mughal monument of Red Fort. The parade is led by the Army, Navy and Air Force. The regiments of the Indian Army, the Navy, and Airforce gloriously march past in their imposing uniforms. The President of India takes the salute. Para-military forces of India, contingents of BSF, NCC, Home Guards also participate in the parade. After this, spectators get a glimpse of India’s defence capabilities as various tanks, missiles and latest equipment used by the military forces are displayed. 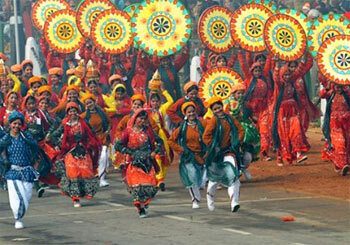 Then a cheering crowd is treated to full extravaganza that shows the cultural diversity of India. This is created in the form of floats that showcases the distinct cultural aspect of each state. This comprises various tableaux, dance and other indigenous art forms. As many as 30 floats cruise past the spectators. 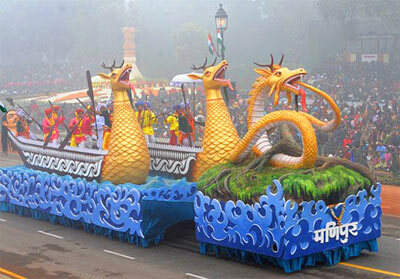 These floats show the various cultural dimensions of composite India, in its states and union territories. These exhibits on wheels depict scenes from the culture of each state and U.Ts, thus showcasing the rich social and cultural heritage of India. The President of India presides over the Republic Day function which comprises a structured flow of events. School children from various schools participate with full enthusiasm and prepare much ahead to perform innovative acts such as tableaux and pyramid formation. In these, they display their prowess in balancing and co-ordination. The awe-inspiring flypast by the Air Force jets is a proud moment for the country and is the concluding part. A regal ceremony in the form of Beating Retreat ceremony on the evening of 29th January marks the end of the Republic Day celebrations. Represented by the bands of Indian Air Force, India Navy and India Army, this ceremony is performed at Raisina Hills, New Delhi, with the President of India as the Chief Guest. Pipe and Drum Bands play patriotic tunes such as ‘Sare Jahan se Accha’. Public offices and schools remain closed to celebrate the significance of the day. Republic Day is celebrated in all parts of the country, starting with flag hoisting ceremonies and parades performed by school and college students. People wear t-shirts and bands bearing the tricolor while government buildings and homes fly the national flag. On this day, people pen inspiring poems and patriotic messages and send these to friends, relatives and acquaintances. Men, women and children proudly wear tri-colored clothes on this day. Children wave flags even as paper flags and merchandise bearing the tricolor sells immensely. Shops offer huge discounts in honor of Indian Republic Day and restaurants offer special Republic Day menus. Many shops come up with curious bearing the tri-color. In each city, people residing in residential colonies celebrate Republic Day with full gusto and participation. It’s an old tradition at Republic Day Parade to invite a Prime Minister of another country showcasing our culture and traditions. In year 2017, India welcomed the Crown Prince of Abu Dhabi Sheikh Mohamed bin Zayed Al Nahyan, as a chief guest at the Indian Republic Day. Check out list of chief guests invited at Republic Day Parade in New Delhi, India from beginning (1950) till year 2019.